Hive defending itself against robbing will fight to the death. The battle can result in the loss of many little lives and even destroy an entire colony. And if the hive is unable to defend itself in a robbing situation, the invading army can strip the colony of all its food. Being robbed changes the disposition of a hive. Bees can become aggressive, and difficult to deal with. In the busy hive during the nectar flow may have a lot of activity at the entrance, but the normal behavior of foraging bees looks different than a robbing situation. Foraging bees go with a purpose. They shoot straight out of the hive and are quickly up and away. 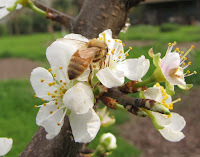 Returning foragers are weighted down with nectar and pollen and land solidly when returning to their hive. Some even undershoot the entrance and crash-land just short of the bottom board. Normal activity at the hive’s entrance can look unusually busy. This is when young worker bees take their orientation flights. Facing the hive, they hover up, down, and back and forth. They’re orienting themselves to the location of their hive. You may see hundreds of these young bees floating around the front of the hive, but there’s nothing aggressive or frantic about their exploratory behavior. Robbing bees approach the hive without being weighted down with nectar. They may not shoot right into the entrance. Instead, they fly from side to side, waiting for an opportune moment to sneak past the guard bees. If you look closely, you may see bees fighting at the entrance or on the ground in front of the hive. They are embraced in mortal combat. These are the guard bees defending their colony to the death. This behavior is a sure indication of robbing. Unlike foraging bees that leave the hive empty-handed, robbing bees leave the hive heavily laden with honey, which makes flying difficult. Robbing bees tend to climb up the front of the hive before taking off. Once they’re airborne, there’s a characteristic dip in their flight path. Reduce the size of the entrance to the width of a single bee. Use your entrance reducer or clumps of grass stuffed along the entrance. Minimizing the entrance will make it far easier for your bees to defend the colony. But be careful. If the temperature has turned hot, narrowing the entrance impairs ventilation. Soak a bed sheet in water and cover the hive that’s under attack. The sheet (heavy with water) drapes to the ground and prevents robbing bees from getting to the entrance. The bees in the hive seem to be able to find their way in and out. During hot, dry weather, rewet the sheet as needed. Be sure to remove the sheet after one or two days. By that time the robbing behavior should have stopped. Never leave honey out in the open where the bees can find it, particularly near the hive and during a dearth in the nectar flow. Easy pickings can set off a robbing situation. When harvesting honey, keep your supers covered after you remove them from the colony. Be very careful when handling sugar syrup. Try not to spill a single drop when feeding your bees. The slightest amount anywhere but in the feeder can trigger disaster. Until your hive is strong enough to defend itself, use the entrance reducer to restrict the size of the opening the bees must protect. Also, be sure to close off the hole in the inner cover. Never feed your bees in the wide open (such as filling a dish with syrup or honey and putting it near the entrance of the hive). Avoid using a Board man entrance feeder. Being so close to the entrance, these feeders can incite robbing behavior.